Outdoor digital signage installers, Digitalvue was approached by Burnley College, part of UClan (University of Central Lancashire) to design and install two large format outdoor LED back lit, 65” TV screen enclosure’s located on the main road into the college’s campus. Kim Menen The Managing Director of outdoor digital signage manufacturers, AquaLite Outdoor assisted James Hogg Designs in demonstrating a unit at Burnley College for appraisal which after further discussions was given the go-ahead. 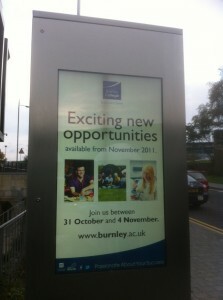 Each enclosure was custom manufactured in exterior grade stainless steel with ground works provided by Burnley College. Both enclosure’s was supplied with two 65” outdoor digital LED media screens located opposite each other on either side of the road facing in different directions. Each screen also featured a custom designed and built quick release screen mount for ease of maintenance. Working closely with the college’s IT department Digitalvue also provided the CMS (Control Management Software) to drive content over two media players located in each enclosure, one hardwired and one Wi-Fi connected. The end result engaged students and visitors with a wealth of information through dynamic content and provided a potent marketing tool for Burnley College to deliver key messages and information concerning the college’s activities. Aqualite”s range of LCD digital signage screens are ideal for queue management and electronic noticeboards in schools, colleges, universities, cinema entrances, pubs and clubs, garden centres, train and bus stations, leisure centres, golf clubs, swimming pools, stadiums, wildlife parks, hotels and hospitality, vehicle advertising, yachts.